Jingle Bell Jazz was one of the coolest albums of Christmas music ever. Originally released in 1962, this unassuming little compilation featured an all-star cast of jazz luminaries like Miles Davis, Dave Brubeck, Duke Ellington and others. It was reissued on vinyl but now it has disappeared into the mists of time. 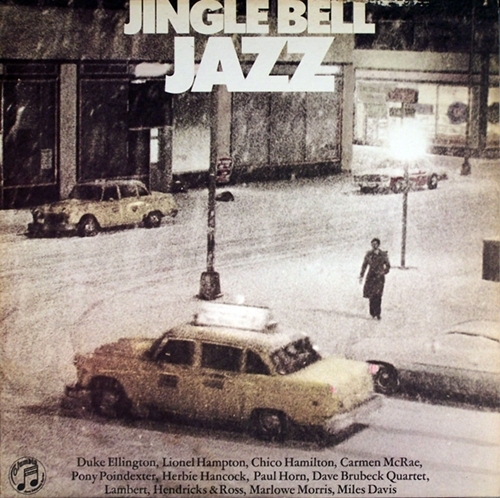 The original Jingle Bell Jazz was issued by Columbia in 1962 (its cover featured a red Santa sack with gifts) and the reissue from 1980 (cover pictured above) only appeared on vinyl LP. In 1985, the label combined Jingle Bell Jazz with another album God Rest Ye Merry Jazzmen, and the resulting CD entitled Jingle Bell Jazz is a distillation of both. Aficionados prefer the original vinyl-only versions of the album, probably because the CD reissue leaves out some crucial artists. So, as our Christmas gift to you, here are some new digital files from the original Jingle Bell Jazz, plus some other cool jazz Christmas tunes. This entry was posted on December 16, 2012 at 3:40 pm and is filed under 30 Days Out (From Christmas) with tags Chico Hamilton, Dave Brubeck, Duke Ellington, Herbie Hancock, Jingle Bell Jazz, Lionel Hampton, Marlowe Morris, Miles Davis. You can follow any responses to this entry through the RSS 2.0 feed. You can leave a response, or trackback from your own site.